On October 28, 2013, a protest procession was held in support of the 18-party alliance strike in Chattkhil at Noakhali. At the end of the procession, the workers were picketing towards different directions. During this time police and Chhatra League attacked the picketers and the police began shooting directly. A police bullet went inside the back of Mahmudul Hossain and came out on the right side of the chest after piercing through his lungs. He fell down on the spot. His colleagues took him to hospital. After initial treatment, he was treated in a hospital in Dhaka. His lungs were operated upon. But he could not be saved in any way. Mahmudul Hossain attained martyrdom November 20, 2013, while undergoing treatment at the hospital. 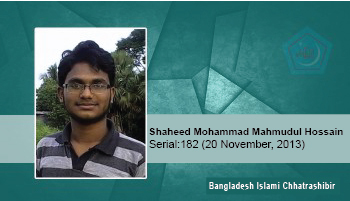 Shaheed Mohammad Mahmudul Hossain was an associate of Shibir.